Robin Rents was established in 1966 by Bill Robinson and specializes in equipment rental serving local businesses, contractors, and home owners. 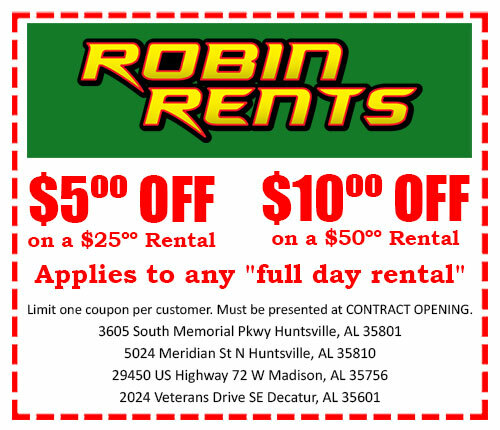 Robin Rents was originally located on Whitesburg Drive in Huntsville, Alabama and moved to the current South Parkway location near Airport Road in 1984. Robin Rents was purchased by the Birdwell family in 2003. Ronny Birdwell and his family, along with their commitment to the community of North Alabama, have expanded the business to four locations in the Tennessee Valley. With fifty years of service experience, over 100 years of equipment rental experience, and an emphasis on customer service, Robin Rents knows that our customers make our success possible. We offer the highest quality rental equipment with names like Titan, Echo, Tsurumi, Multiquip, Toro Dingo, Terex loaders, John Deere loaders, John Deere excavators, Nifty lifts, Haulotte lifts. Robin Rents is the only Hilti Authorized Distributer in North Alabama. We also sell and service other trusted brands like Marshalltown, Northwest Instruments, Norton Abrasives, Crick, Topcon and Makita to help serve our residential, commercial, farming and construction industries located in the Tennessee Valley. Robin Rents has four locations throughout North Alabama. The South Parkway location is conveniently located to Redstone Arsenal, UAH, Boeing, Vaughn Braun Civic Center, Huntsville Hospital, Monte Sano State Park and the City of Huntsville at 3605 Memorial Parkway SW just north of Airport Road in Huntsville. Robin Rents North Parkway store is located near Alabama A&M, Chase Industrial Park, Vulcan Materials, Oakwood University, Blake Bottom Industrial Park, Across the Pond, City of Meridianville, City of Hazel Green, City of Fayetteville, just north of Wilson Lumber at 5024 Meridian Street North, Huntsville, Alabama. These two stores are located in the heart of the Aerospace and Technology Corridor in the Rocket City. The Madison and Limestone County location opened in 2006. It’s conveniently located near the Huntsville International Airport, Jetport Municipal Golf Course, Jetplex Industrial Park, Bridge Street Town Center, City of Madison, Toney AL, Harvest AL, Madison County, City of Athens, Browns Ferry Nuclear Power Plant, Athens State University, Elkmont AL, Ardmore AL, Ardmore TN, and Mooresville AL. The highway 72 store is located at 29450 US Highway 72, Madison, AL, just west of County Line Road serving both the Limestone County and Madison City areas. Robin Rents newest location, opened in August of 2016, will serve the Decatur, Al area. It is centrally located to the City of Decatur, City of Priceville, City of Moulton, and City of Hartselle. Robin Rents holds a high standard of moral values along with a family atmosphere. We also believe in a willingness to serve our community and our fellow man, to the furtherance of our great country, the United States of America.